On the Ground, a program run by the Michigan-based Issue Media Group, parent company for Southwest Michigan's Second Wave, gets underway next week with local coverage of the Edison Neighborhood on April 5. This program helps to tell the story of the people, projects, and innovations that are creating “what’s next” for communities. The intended impact is for “solutions-oriented” media coverage, engagement and ultimately understanding of the community, resulting in awareness and investments that can contribute to the vitality and prosperity of the district covered. The concept of On the Ground is to use an “embedded journalism” model to maintain a presence in a specific neighborhood for three months. During this time the publication focuses weekly coverage on those neighborhoods to tell the story of the businesses, individuals, and nonprofits working and living there. Finally, the publication produces, covers, and promotes a finale event upon completion of the project. The event depends on what best fits the neighborhood. The finale event for the Edison neighborhood has not yet been determined. On the Ground coverage began May 2012 with a pilot program through the IMG publication Flying Kite based out of Philadelphia. Former Flying Kite publisher Michelle Freeman developed the concept of an ongoing initiative that aimed to dive deep into neighborhood transformation. For 90 days, a project editor from Flying Kite was embedded in a vacant storefront or building and after three months they moved on to the next neighborhood. Between May 2012 and August 2013, Flying Kite was embedded in four neighborhoods in Philadelphia and New Jersey. IMG adopted this program model in 2013 for its local-based publication Model D, which implemented its first On the Ground in the Osborn neighborhood in the city of Detroit and was followed by another program in Brightmoor. The way it works is IMG identifies a partner in each neighborhood who assists in connecting and orienting a dedicated journalist with residents. In order to establish a lasting relationship with the community and the groups involved with the project, the project editor dedicates time to researching the history of the neighborhood and developing an editorial framework based on the interests of the community. The journalist attends monthly neighborhood events and hosts dedicated editorial advisory conversations to engage residents and stakeholders for story ideas and networking. In Kalamazoo, the On the Ground project also will involve training local residents as reporters. They will attend four classes and publish stories in Southwest Michigan’s Second Wave. They will be paid as journalists for attending classes and having their work published. Their relationship as writers for Second Wave is expected to continue after their training. Since launching On the Ground back in 2013, IMG has worked in over 15 different neighborhoods across the country. There have been On the Ground programs that have taken place in Memphis, Tampa, Grand Rapids, Dearborn, Ypsilanti, Pontiac, Cincinnati, and Detroit. IMG views this engagement as an initial investment into a neighborhood. Programs are tailored to approach the needs of each neighborhood differently and treated as the first step in creating long-term media impact in the highlighted areas. The Edison neighborhood has invited Second Wave to be the next community covered in the On the Ground Program. The On the Ground program is made possible by funding from the City of Kalamazoo, LISC, the Fetzer Institute, the Irving S. Gilmore Foundation, United Way of the Battle Creek and Kalamazoo Region, Michigan WORKS!, the Kalamazoo Community Foundation, and the Arts Council of Greater Kalamazoo. 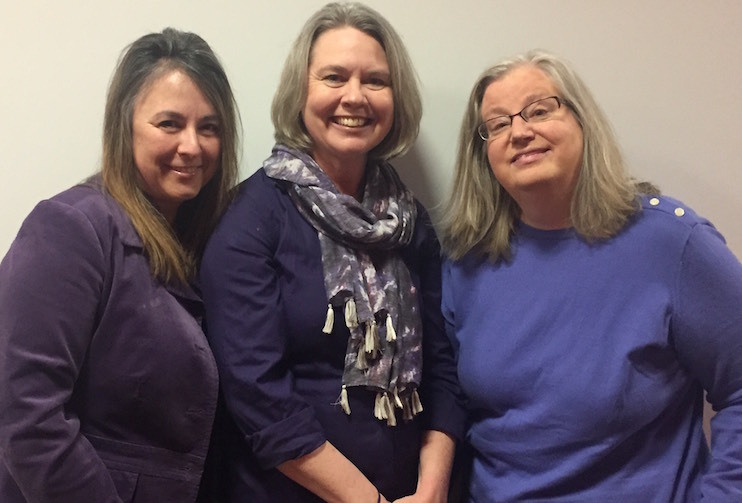 Your On the Ground Team is Managing Editor Kathy Jennings, Project Editor Theresa Coty O'Neil, and Engagement Manager Vicky Kettner, and photographer Fran Dwight.